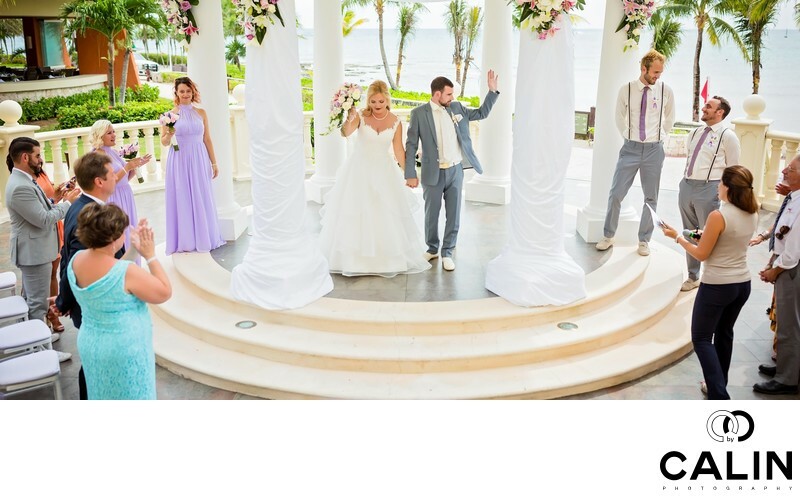 This album spread features the recessional at a Barcelo Maya Palace Deluxe wedding. Usually, once the couple is pronounced husband and wife, everybody relaxes and anticipates the wedding reception. This album spread looks like a movie scene. The bride and groom are waving to the guests while everybody is standing and applauding. On the right-hand side of the picture, we can see two of the groomsmen looking at each other and laughing. If I were asked to select the picture that described this wedding perfectly this would be my favourite.